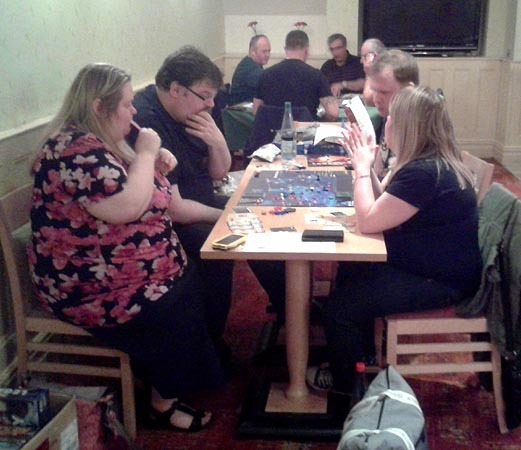 Beer & Pretzels Games Weekend, Burton on Trent. This year's Autumn Beer & Pretzels was quieter than expected on Saturday, partly due to the centre of town being closed for a demonstration and a counter demonstration. Although nothing happened at this end of town it did put people off from venturing down. Sunday, however, was up to the usual numbers. 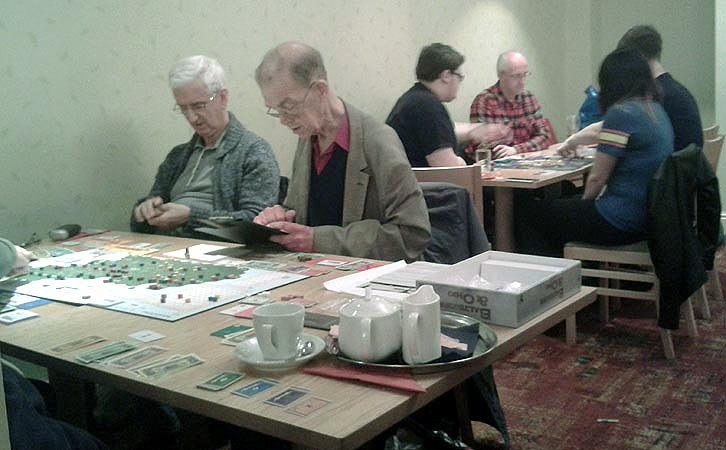 The people who did make it had a thoroughly good time as usual, with a large and differing selection of games being played from old favourites to new, just back from Essen, games. 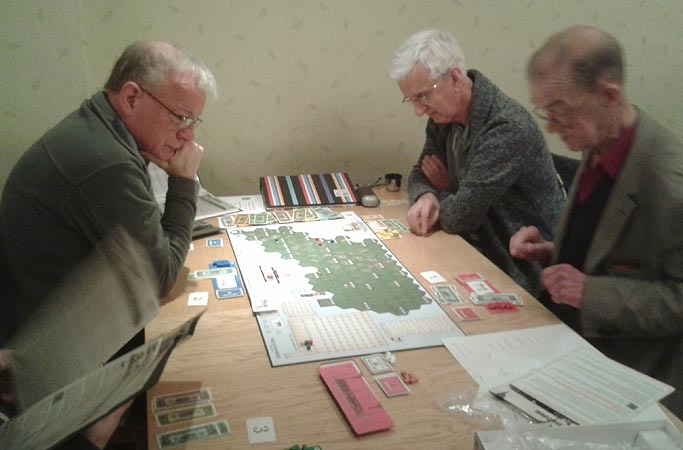 Recently we have been playing a lot of Discoveries: The Journals of Lewis and Clark, but this weekend the original Lewis and Clark: The Expedition was being played. 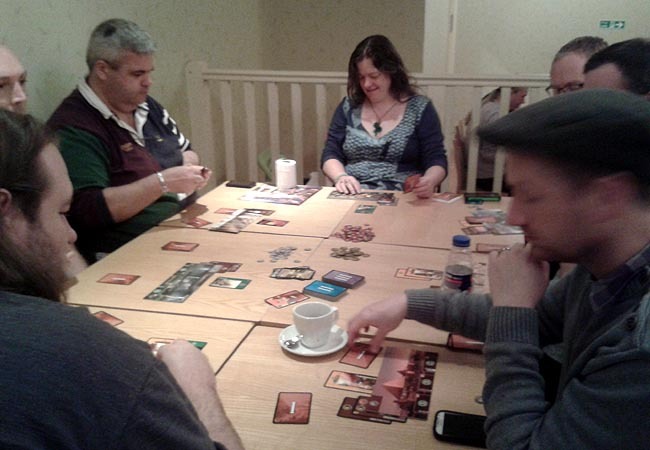 A game of Pandemic Legacy was proving a difficult game to win, with season 2 eagerly awaited. I got my first game of Tzolk'in: The Mayan Calendar, it's quite a brain burner with so many different choices to make, but beginner's luck took me to second place. Next time, knowing what I'm supposed to be doing I'll probably be stone last. Our library copy of Patchwork came out as many people have been unable to get their own copies. Hopefully, as it is our best seller so far this year (even though it has been unattainable of a few months) it will be back in stock soon. 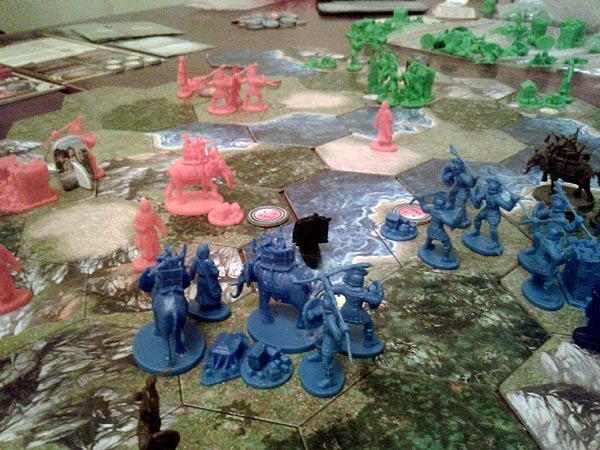 The Clash of Cultures game looked very impressive with lots of miniatures on the board. We are, of course, biased because it has elephants! Winding down at the end of Sunday we played both The Resistance: Avalon and Nosferatu both of which caused much hilarity with people being accused of being on the bad side, then being believed that they were really on the good side (maybe! ), oh the paranoia... both quick fun filler games. There were many other games played, some of which are sadly now out of print like Colosseum, but keeping tabs on all the games played is impossible especially as we want to join in the event. The 7 Wonders Tournament went down well with Phil Archer being the overall winner, Guy Arnold in second place, Gary Wright third and Richard of unknown surname - neither of our two usual Richards so I suppose that makes him Richard III - came fourth. 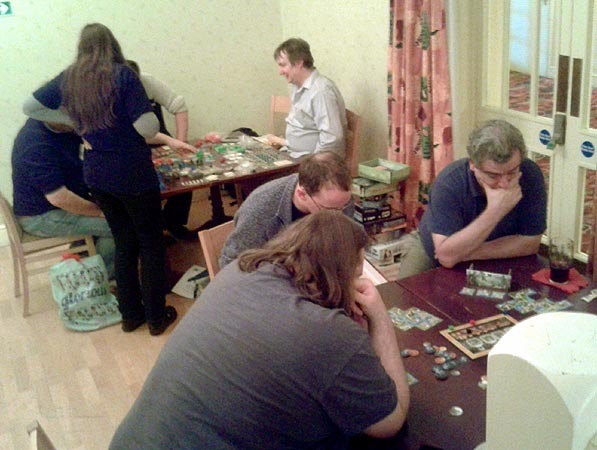 Here are a few more pictures of the event, not many as we spent most of our time playing!